If you conduct a poll among Indian mothers at this time of the year for the most frequently heard phrases at home, I bet these will be among the top 5. Number 1 - I am hungry, give me something to eat - NOW!!!. Number 2 - Can I watch TV for some(more)time...Ple..asee? Other Mom phrases would be 'Please stop yelling and fighting with each other'', "You are both going into one bathroom each for the next 15 minutes''(this never works I tell u!) "I wish school never closed even on Sundays''. Other kid phrases "AMMA...he changed the channel...''(followed by screaming lungs out), "You are a very bad Amma, wait till Appa comes home'', ''Let me tell your Mom what you are doing to me (my daughter threatening me if I don't give in). Its birthdays and birthdays in the family from January to May, April being the month of three birthdays and one wedding anniversary, July the month of 3 wedding anniversaries within 10 days! The kids' birthdays, more often than not, are celebrated at home. We normally keep it to a small group of their 'best-friends' at that point of time. The group was pretty much the same for the past 5 years and has changed only recently with my son's new all boys group. He had wanted all of them invited for his 9th birthday along with the old friends. He loves to have people over and we had to temper his enthusiasm. He cried loud enough to scare the pediatrician in the hospital when he was born (turned out he was just very hungry!!!). 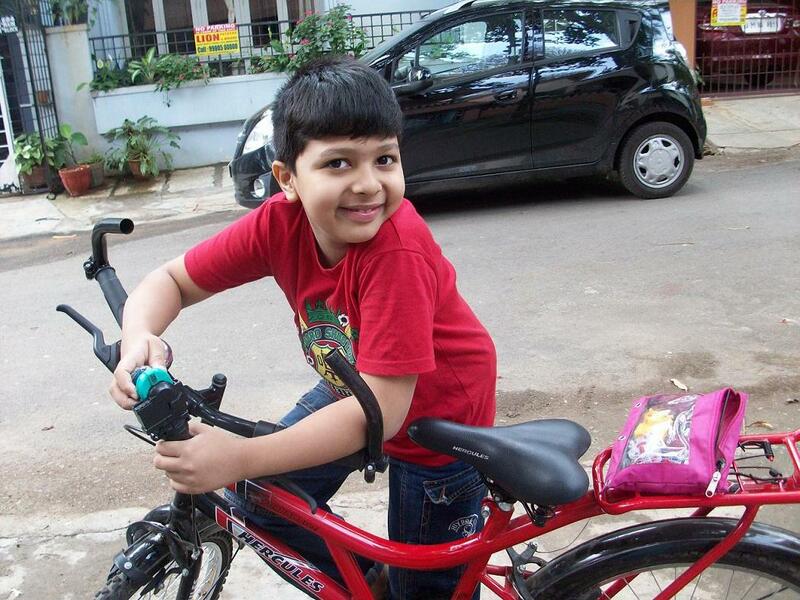 He made me cry when as a 4-year-old, he never asked me to pick him up as Amma had a baby in her tummy. He is my staunch supporter most of the times when he senses me and hubby having a difference of opinion. He is a big foodie and loves to serve even water in style. His bed time reading - my recipe books a good number of times. Loves to draw sketches of cars and has plans to sell them to the Tatas no less - the first model to be sold to him. 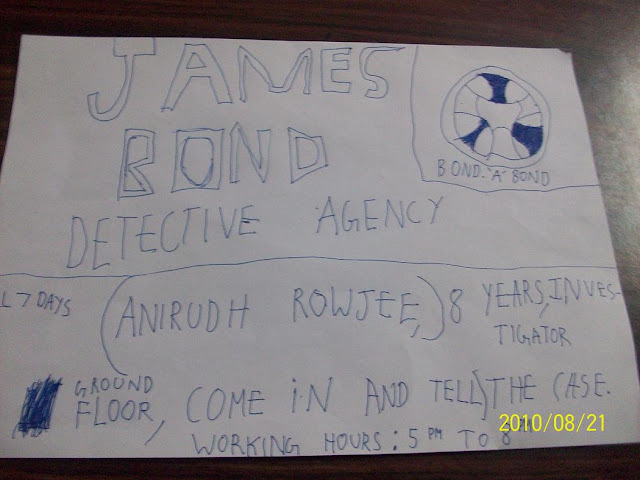 The little entrepreneur put up a lemonade stall, replete with a board which read "Rowjee's Lemonade Stall'' of front of our house last summer. Father-in-law has a home appliances store. Anirudh often accompanies him to the store. A customer had once asked if there were any 'offers' if he bought a television. Son seriously replied "If you buy a television at our store, you get the remote control free''. The then 6-year-old was kidnapped in his dream. He told the kidnapper that if he let him free, he would sell an air-cooler at a discount of 50% to him! He had once told me with tears in his eyes that he would keep on collecting my pictures. The moment I die, he would paste them all over his room! Well, I did not know if I had to laugh or cry!!! Back to the cake - it is a very important part of the birthday and we discuss ahead what cake it should be. I try to make it in line with whatever is his current fad. It was once a Racing Track Cake , a Helicopter Cake the other year and this year a Beyblade cake (surprise, surprise!!). I tried to make one with a small beyblade drawing on it as. It turned out quite sloppy looking (me artistically challenged) but still the boys thought it was cool to have a beyblade cake and a home-made one at that! Notice (hard!) the 'L' in the middle which stands for a Lightning L Drago. I made this cake a vanilla sponge with almond, chocolate and whipped cream filling. I normally bake 2 cakes for the kids' birthdays. 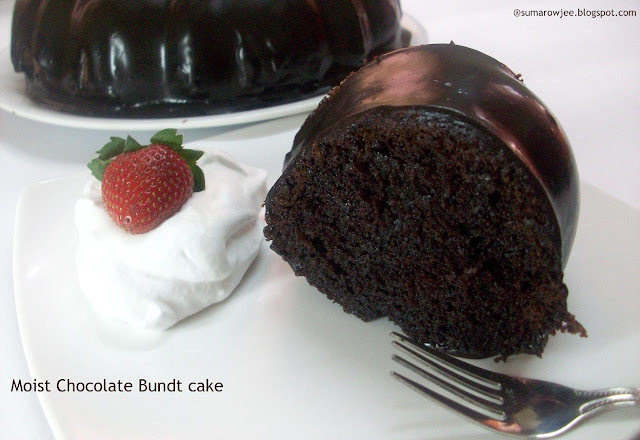 A chocolate cake doesn't fail to please most kids, so played safe and baked a Moist Chocolate Bundt Cake too. Sis and family were to come over for lunch the next noon. The biggest budding foodie in the family is my son, I wouldn't have it any other way! He took a few of my recipe books to bed to help me decide what I could dish up. By morning, he was ready with the menu written on a piece of paper and put it on the fridge door. He even decided that the names of the dishes would be written on paper and placed in front of each dish (now whatever this is called, enlighten me!). Foodie bonding also saw me give my brother-in-law a 'demo' of the Instant Microwave Brownie for those emergency sugar craving situations. The lunch was at short notice but there was no way I could not prepare at least two desserts for my brother-in-law's sweet tooth. 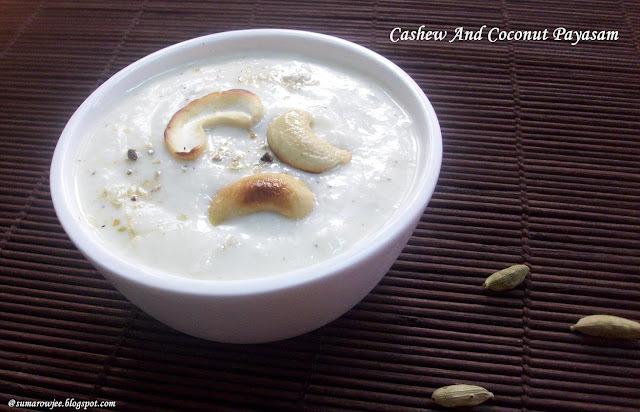 The other one was a creamy and tasty Cashew And Coconut Payasam. Its been super hectic the past few days, with the days just zooming past. Kid sis and family have come down for a few days, the entire extended family got together, we celebrated my father's birthday, shopped till the sis dropped. Saw all the stores in Bangalore I haven't been to earlier. I am not much of a shopper and normally all the marathon shopping expeditions are only sis-in-law comes down from the US. Very important part of the itinerary, the typical and much needed eat outs for the visitors, who are starved of the restaurant food in India, the true value of which only the desi living abroad knows. So lots more eating out, more shopping lined up before sis boards her flight. And again, as its a busy time at work too, blogging has taken a temporary back seat. There are so many things we want to do in a day, spend time with kids and family, entertain (and be entertained;-) work, meet up friends, cook, bake , blog... sigh! But then, I would hate to neglect the blog baby for long (u can identify with this feeling I know!) and I have to say a quick hello and then rush back to my mile long to-do list. The rising mercury levels has had all of us guzzling down gallons of water and nothing is more welcome than a refreshing cool drink. Here comes one of my favorites, a Virgin Pina Colada. Pina Colada is a sweet drink with pineapple juice, rum and cream of coconut as its basic ingredients. A search for virgin pina colada gave me pineapple juice, coconut cream or coconut milk, whipped cream or ice cream as the ingredients. The result, a very pleasing drink with a hint of coconut and vanilla... a must try this summer. But wait! They taste good!! In spite of me doing all that playing around! My kids have been eating these since the time they came out of the oven. My son just had 2 of these for 'dessert' after his meal. 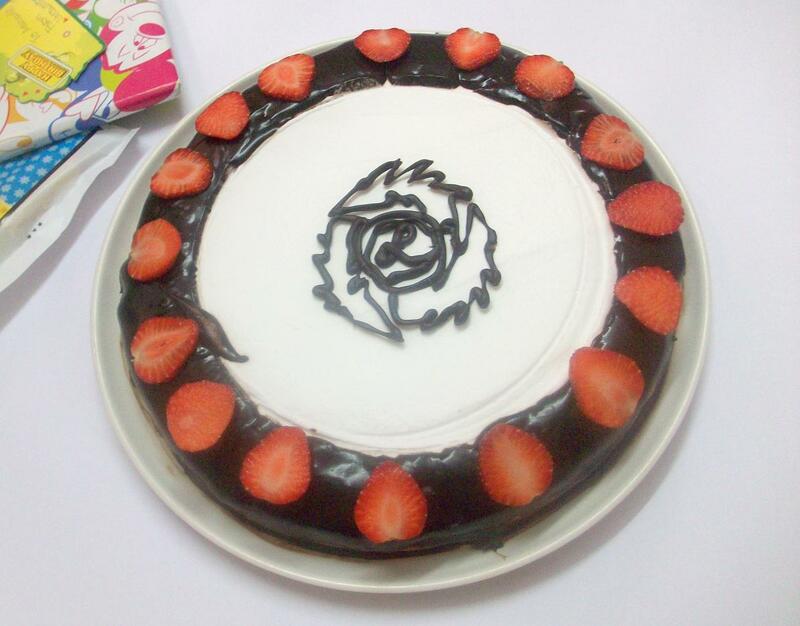 And I am already planning to bake these again very soon...variations, other similar recipes...you got it? 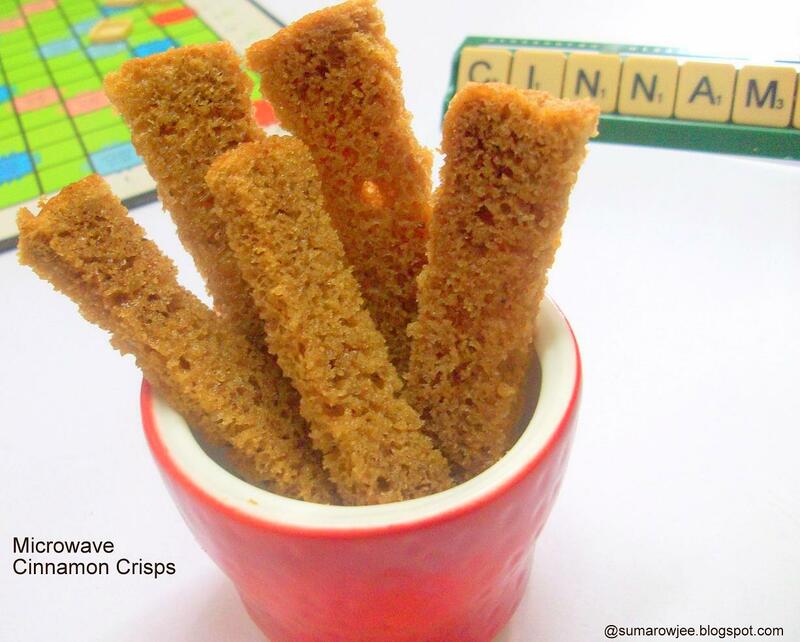 A week later- I baked these sticks again today. I had baked these with part whole wheat previously and was left wondering if I had done it right. Halved the recipe and baked with only APF today. 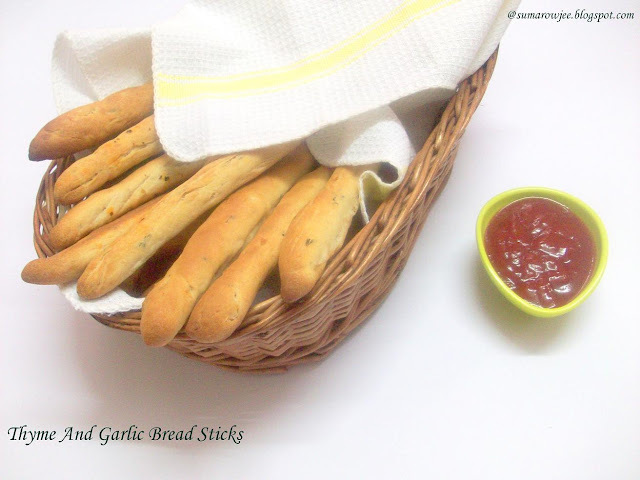 The outcome - Tasty bread sticks again. The conclusion- A forgiving recipe which will give you good taste. Don't we love recipes like these? Specially those with low fat and taste? Am aiming at spacing out my bakes, particularly those with more sugar in them. So savory it has to be more often than sweet...sigh!! did not hear it? Double sigh!!! Dragging my mind away from the sweeter pleasures and moving on to the savory, the best thing that happened to me lately - yeast - is my savior. I now can't imagine my baking life without yeast. And if you know me, you know - if I think yeast, I think Champa... yes, I absolutely love her breads. OK. I admit. Again. I was living under a rock all these years! Because I discovered brownies only recently. Am discovering that I LOVE brownies - big time. Oh, why did I not try these all these years? I am discovering I am partial to the fudgy, moist ones. Those made with melted chocolate tempt the die-hard chocolate lover in me. Add some toasted nuts and make them less sinful with the addition of olive oil - I am at a very serious risk of gorging on these every now and then. Someone stop me! Help!! 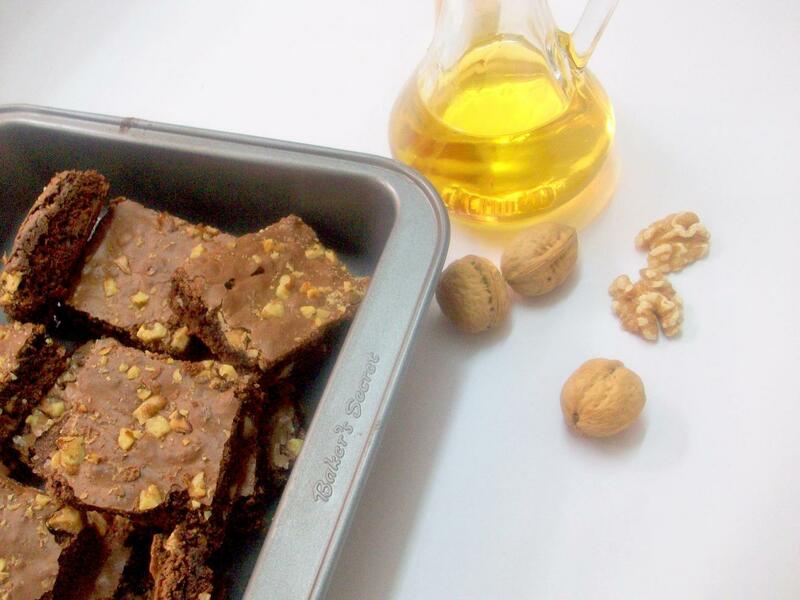 The decadent looking Olive Oil Walnut Brownies on Deeba's PAB have been haunting me since the time I saw them. I finally made them and so very glad I did. Made with melted chocolate and olive oil, they are moist, chocolaty and so delicious! Crispy top, moist and chewy inside. The walnuts add the nuttiness and crunch which goes so very well with chocolate anytime. They take a third of cup of olive oil for a tray of brownies, a big plus for those counting calories or not wanting to use butter. 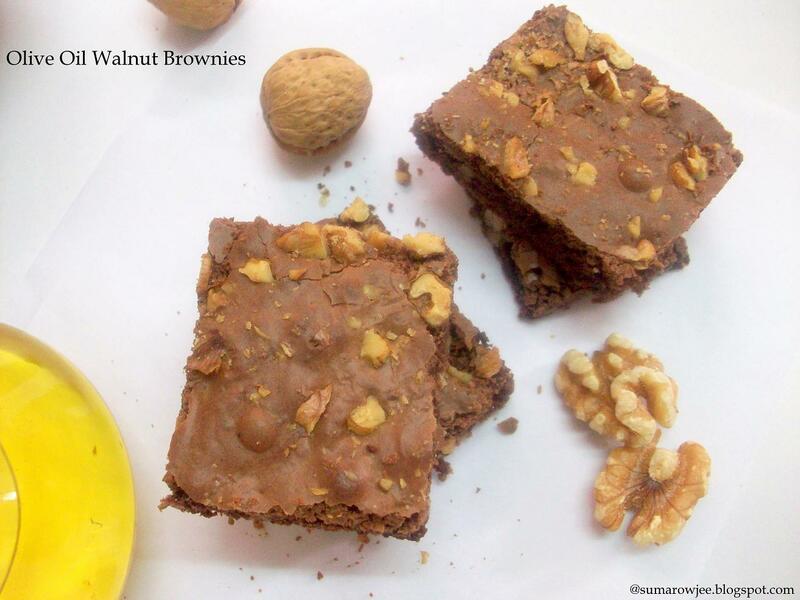 Beware- since these brownies are not as rich as those made with butter and tend to be high on taste, you may realize that the entire batch is over even before you know it! I have made the recipe as is on Deeba's blog, except for the reduction of sugar as she mentions that lesser sugar should be just fine. I found the brownies just about sweet, which is perfect for me. I think half a cup of chocolate chips should make these brownies extra decadent. That's a note am not going to forget the next time I make these bites - truly darned good bites Deeba, thanks a ton for yet another keeper of a recipe! Crispy Cottage Cheese Fingers - Uber Yumm!! Kids can sometimes embarrass you like anything! A familiar, not-so-pleasant-situation for most parents. They say the most innocuous things at the most inappropriate of times. Innocent words which will have all the 5 liters of blood rushing to your face at that instant and in retrospect send you into peals of laughter. A mother of two, I have had many many such moments. Once, we were at a friend's place for lunch and the meal included pooris. My then 3-year-old son had asked me ''Amma, what is this?'' I sheepishly told my amused friend that deep-frying is something I rarely do. . I had once made pooris at home, my parents had called and hubby gleefully told them the highlight of the day. My Mom was shocked, brother wanted to know if the pooris were ahem, actually 'real' pooris or microwaved or baked ones. Oh yes, they had fun at my expense! My daughter had once wanted to know if Gulab Jamoons can also really be made at home! Seriously - I really have a reputation for not making deep fried stuff. And no, am not proud of it. Not that I don't use fat or I would not be writing a baking blog. I have a huge mind block against deep frying. Even now. I like to eat deep fried things, but not enough to make them now and then at home. They do not figure first on my can't-do-without food and I won't crave for them if I don't eat them for months, err..lets make that a month. Yes, desserts are my can't live without food. Put me off desserts for a week and they will start multi-starring in the blockbusters of my dreams. I am a complete die-hard dessert person. A friend of mine had got some special paneer from Amritsar for me. I was wondering what I must do with it. A wicked idea, a sinful treat, a recipe I have been drooling over since aa...ges. 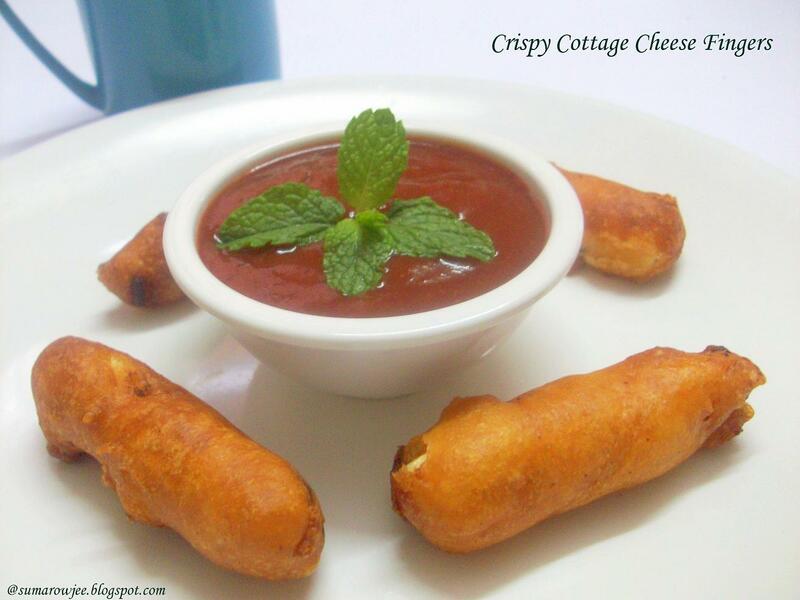 Cottage Cheese Fingers! Throw caution to the winds. Make it double sinful. Full fat super soft paneer (nothing less from Amritsar! ), marinated in tomato and chilli sauce, encased in crispy, crispy covering. Mind-blowing! It was so so good, I could not stop eating at a couple of pieces, kids loved them to the hilt, hubby ate them with his eyes closed. No exaggeration this! I made these again as I wanted to put these on the blog;-) called son's cycling friends to help finish them, and they were a very happy bunch! Well, all I want to tell you is - please, please do try this out! And don't blame me if you get very seriously addicted!